The Pico NVH Essentials Advanced Kit from Pico Technology is the cost–effective answer to the many NVH problems facing technicians today. Providing real-time diagnosis to the technician in the form of either: a bar graph, a frequency chart, a 3D frequency chart, RPM order or road speed view. The ability to start the recording before a road test, and play back the recording for analysis on your return, ensures that driver attention remains on the road. Saving the recordings couldn’t be simpler: much like our other automotive software you simply save the file to your laptop’s hard drive. 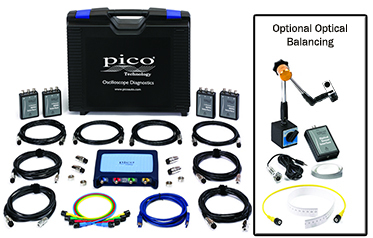 The optional Optical Balancing Kit provides the high-quality optical sensor and magnetic mount required for use with the PicoDiagnostics shaft-balancing software. The Pico NVH Essentials Advanced Kit includes a Pico 4425 Automotive Oscilloscope, and comes complete with everything (J2534 Scantool or VCI not supplied), you need. Starting at $3525.00 Free shipping!